Join the friendliest bunch of garden enthusiasts in San Diego! 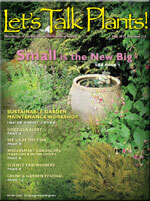 All members receive the free online copy of our 26-page monthly newsletter, Let's Talk Plants! For $12 per year they can also receive the printed version in the mail. The newsletter features upcoming garden-related events, plant descriptions and information, gardening tips, book reviews, and more. Free admittance to monthly meetings. A monthly invitation to a free Featured Garden hosted at a member's garden. This is a great opportunity to socialize with other members and get an exclusive viewing of the best gardens in the county. The opportunity to travel with other members on our exciting pre-arranged tours. Previous trips have taken us to places like the Gardens of the Bay Area, Lotusland in Santa Barbara, and Longwood and Chanticleer in Philadelphia. A discount subscription to Pacific Horticulture magazine for West Coast gardeners, an award winning quarterly publication. SDHS is a pleased to be a sponsor organization of the Pacific Horticulture Society. A discount on purchase of the comprehensive book Ornamental Trees for Mediterranean Climates, published by the San Diego Horticultural Society. New members are invited to an informal Orientation Party hosted in one of our members gardens. It’s a great opportunity to learn more about SDHS, make friends, meet board members, and view a wonderful garden. Discounted membership to the San Diego Botanic Garden. Discounts on tickets to special lectures and local garden shows. Discounts at numerous fine nurseries and businesses of SDHS sponsors.